The 36.45 metre motor yacht Clorinda, jointly listed for sale by Ocean Independence and Northrop & Johnson has had a price reduction of €1,000,000. Built in GRP by Italian yard ISA, Clorinda was delivered as recently as August 2017 to become the 11th hull in the yard’s ISA 120 Sports series. Her luxurious interior, designed by Francesco Guida, hosts up to ten guests in five cabins comprising a split-level master suite on the main deck, two VIP suites and two twins, all with entertainment centres and en suite bathroom facilities. A further three cabins sleep five crew aboard this yacht for sale. 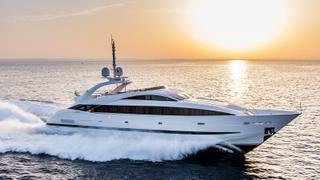 Her open-plan saloon sports an unconventional layout, as the lounge is situated amidships and the dining area is back aft. A particularly stylish outdoor area is the sundeck, featuring a circular spa pool, 12-person outdoor dining space, two built-in sofas, as well as a wet bar, complete with dumbwaiter and ice maker. Power comes from three MTU 16V 2000 M96 diesel engines linked to KaMeWa water jets, which allow for a top speed of 34 knots. When trimmed back to her cruising speed of 27 knots, Clorinda is capable of extended coastal cruises, thanks to a total fuel capacity of 22,000 litres, while the ABT Trac electric stabiliser system will ensure a smooth cruising experience for all those on board. On display at the Miami Boat Show, Clorinda is now asking €11,900,000.